“Opinion is like a pendulum and obeys the same law. If it goes past the center of gravity on one side, it must go a like distance on the other; and it is only after a certain time that it finds the true point at which it can remain at rest. This was after a strong jobs report on May 2, 2014, showing payrolls grew faster than expected and unemployment dropped from 6.7% to 6.3%, which is quite a remarkable contraction in one month. Still, the fact that every single survey participant is bearish is striking. 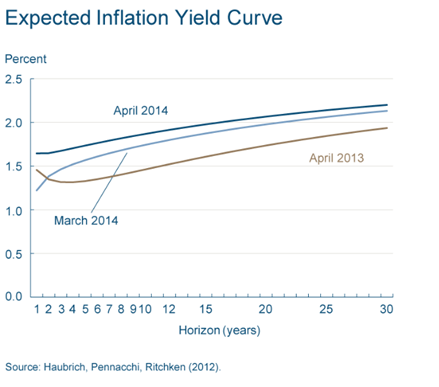 The last time the survey had that result was in May 2012, when benchmark yields were well below 2%. “Literally there is maybe one economist in the United States straddling the bullish/bearish divide on interest rates. The rest are bearish,” Bianco writes. Everyone was leaning in the same direction as the headline above showed so there was very little selling pressure. Ukraine and the tensions with Russia could be leading investors to want the security and safety of Treasuries. 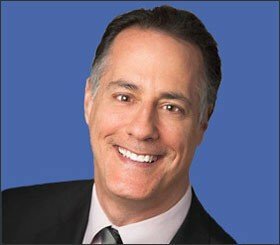 Short rates still too high? Let’s look at some of the relevant charts. 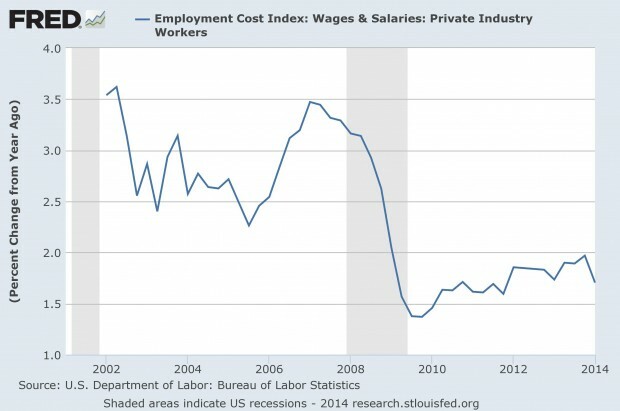 The first one is wage inflation. Although it was in an uptrend between late 2009 and 2013, it seems to be decelerating now and has yet to reach the 2.5% to 3.5% growth that took place between 2001 and 2009. 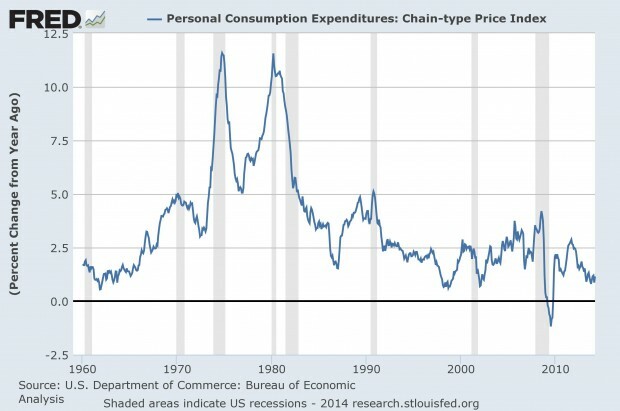 The Fed’s favorite inflation indicator is the Personal Consumption Expenditures index and the rate of change of this is also slowing down below the minimum Fed target of 2.0%. The Cleveland Fed’s inflation model is also showing modest projections for inflation for up to 30 years that barely exceeds 2.0% in the later years. 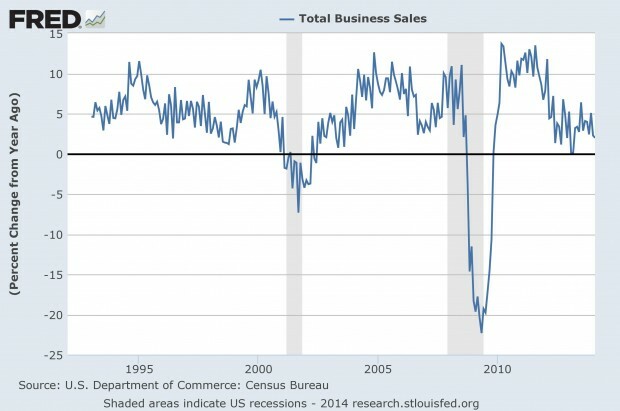 Business sales are not very robust and the rate of growth is slowing here as well. This, combined with very tame inflation readings, suggests an economy that is somewhat demand deficient. 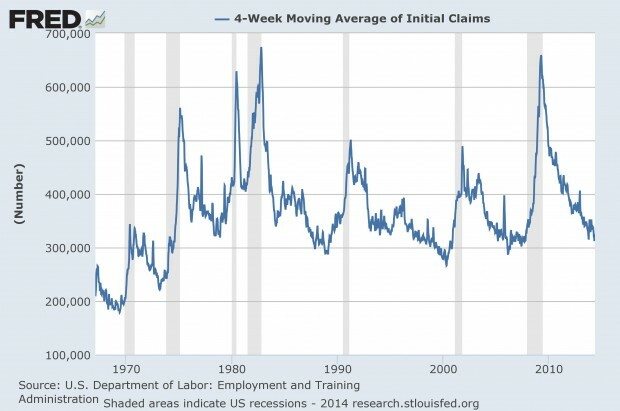 One of the best business cycle indicators is initial claims filed for unemployment insurance calculated on a four-week moving average. As the following chart shows, when claims get close to the 300,000, that tends to represent more of a business cycle peak and a recession eventually ensues. This is not to say that once it hits 300,000 or close to it that the economy turns on a dime and goes into recession. Rather, it’s just pointing out from a historical perspective that this expansion is starting to age and the risk is probably a bit more to the downside than the upside. 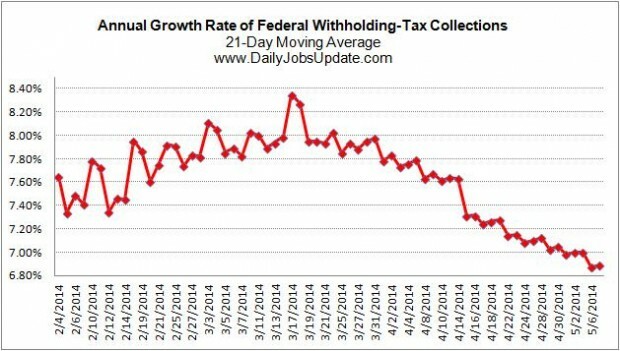 Another indicator that seems to be indicating a slowing rate of growth in the job market is federal withholding tax collections which have been in a downtrend since mid-March. Receipts are still growing, just not as strong as they had been. This is something to keep an eye on. There is also a concern now that the federal deficit has dropped so much that there is now a shortage of 30-year Treasuries. The government is selling a lot less of this debt and pension funds have a high demand for it to offset some of their long-term liabilities. Fewer available bonds, along with a lack of inflation and increased foreign buying, help to explain why longer-term Treasuries are surging this year even as the Fed pares its own bond purchases. 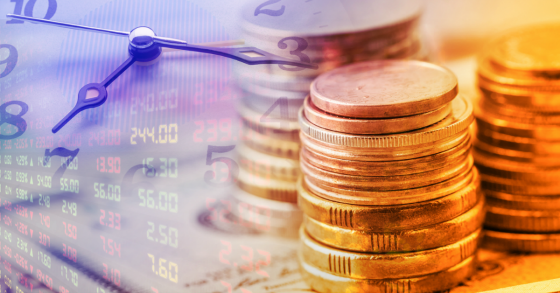 The demand has pushed down yields on 30-year government debt by more than a half-percentage point to 3.37 percent, the most since 2000, data compiled by Bloomberg show. 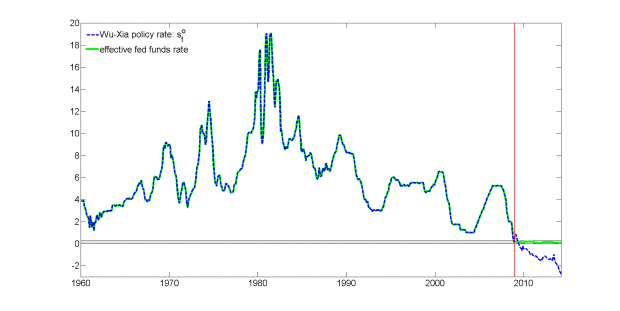 Finally, to end this chart-o-Rama post, I’ll turn to a pretty cool esoteric graph that attempts to estimate what short-term interest rates would be if they could go negative. This is called the shadow rate. The chart shows how well this methodology tracked the actual effective federal funds rate. Based on the current estimate the rate should be -2.89%, the lowest rate in the 50+ years the model has been backtested. “Perhaps in no form of knowledge is a personal experience so indispensable as in learning to see that all things are unstable and transitory in this world…and that in a world where all is fleeting, change alone endures. He is a prudent man who is not only undeceived by apparent stability but is able to forecast the lines upon which movement will take place. Very thought provoking, Gary. Thanks. I wish I had more money to invest in CWS since someone with your level of thinking and understanding is at the helm. Your comments about cause and effect reminded me of a seminar in the early 60’s where we had a book titled “The Environmental Theory of Management” by E. L. Shaner. The author uses 54 pages to lay the groundwork for what you covered in the paragraph above. Very few people are able to analyse abstract causes accurately enough to predict concrete effects and I think you are a member of that group and CWS is very fortunate to have you in your position. Keep up the good work. Thanks again Pete. I always appreciate your thoughtful feedback and your great support of us. The shortage theory of governement securities can lead to another opinion on the Fed’s tapering. Given the data you presented regarding the growing demand for U.S. treasuries it would seem that the Fed’s actions are being offset by the reduced supply of treasuries due to the shrinking deficit. One question I have is whether or not the unexpected fall in the federal budget deficit and the equivalent fall in supply of treasury securities offsets the effects of the Fed’s tapering? I think that is one of the main reasons why the Fed is tapering. There is less need to issue Treasuries with the shrinking deficit. Had the Fed kept buying $40+ billion a month of Treasuries it would take up a huge percentage of the securities, leaving very little for other investors.